Order in the next 12 hours 38 minutes and it will ship today! Great for taking pictures! Good to have more than one lighter on hand per firework because lighting takes longer than a regular candle. The sparklers we,ordered were great. The length we ordered (20") was the perfect length. About 100 people lit their sparkler, the bride and groom ran down the center of the "sparkler tunnel" on their way to the limo. All the while the photographer took pictures. It was great fun and a neat unique send off for couple. Our guests loved the sparklers during our sendoff from our wedding reception. They looked great in our pictures too! I received the sparklers in a very quick turnaround time from the date I purchased them. I actually expected it to take longer so I ordered them about a month and a half before the wedding! Oh well, better early than late! Have ordered twice from Superior. Both experiences yielded prompt delivery and ordering was easy. Received products much earlier than expected on both occasions. Dependable. Highly recommend! My husband and I were married on Sept. 14, 2013. We used the sparklers for pictures and the exit of the venue. Great Customer Service!!! Great Customer Service!!! Very nice packaging! Great for weddings. A decently thick sparkler. WONDERFUL Customer Service!!! Some sparklers came damaged, and customer service went above and beyond with helping us out by sending us a completely new order of sparklers!!! Amazing. Thank you for making the process easy and hassle free! Will and HAVE recommended you guys to customers of mine in my Etsy shop who look for sparklers daily. Great! This was great for my wedding reception. Very pretty and bright. Loved it! received my order fast! received my order fast! Used the sparklers at a hollywood themed cocktail party. All the guests were outside and greeted the guest of honor with the sparklers. It worked great! Overall, very pleased with the entire process of my order. Great customer service. 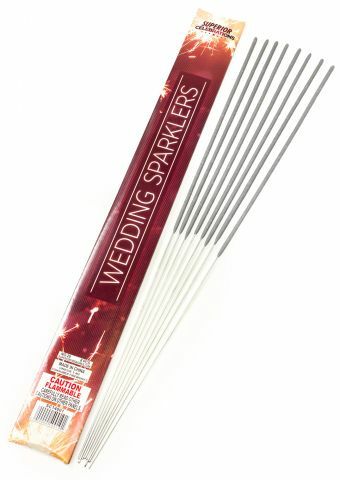 We used these sparklers for the exit after our wedding reception. They lasted as long as we needed them to and made for great pictures. Great for our Wedding! nice metal ones! Great for our Wedding! nice metal ones! We used these for our wedding and they were just what we were looking for. These sparklers were a great addition to my wedding. They were long, bright, and beautiful in pictures and in the evening setting. Perfect for a sparkling exit! Perfect for a sparkling exit!
" The perfect wedding addition" " The perfect wedding addition"
This product performed exactly as it claimed. It was the perfect wedding send-off and lasted just enough time to get great pictures of the bride and groom leaving the ceremony. The pops were bright and perfect in the night-time setting of the mountains. Will be buying them for my sons wedding in Dec. I got these for my daughter's 13th Birthday celebration. We had several girls who said they had a bad experience with sparklers in the past and they were a little reluctant to participate. Once some of the girls had them the others realized that they were safe and would not burn their hands. The girls all joined in and we used every last sparkler!! A good time was had by all!! I purchased the sparklers for our send off and it was the perfect ending to the the PERFECT WEDDING!!! Very fast and easy to work with! Perfect for our sparkler getaway! Perfect for our sparkler getaway! Arrived quickly, packaged neatly, and nearly smokeless... perfect for our reception getaway! We ordered these for a wedding send-off. They are a great size and very pretty. They were delivered very quickly. I'm using these for a sparkler send off at our wedding. What's great about them is that they are so long and you won't get burned.